February 23, 2016 – Earth’s atmosphere is our natural shield against the harsh conditions of space — including everything from meteors and falling satellites to deadly ultraviolet radiation from the sun. It also contains the air we breathe, the weather we experience and helps to regulate planetary temperatures. The atmosphere consists of layers of gases, called “air”, that surround the planet and are retained by Earth’s gravity. “Air” is the common name given to the combination of gases used by organisms for breathing and photosynthesis. By volume, dry air contains 78.09% nitrogen, 20.95% oxygen, 0.93% argon, 0.039% carbon dioxide and smaller amounts of various other gases as well as varying amounts of water vapor. Air composition and atmospheric pressure is not consistent throughout the atmosphere, however, and varies at different altitudes, giving the atmosphere 5 distinct principle layers. Beginning at the surface of Earth, the troposphere extends to around seven miles up. This is the layer we live in and contains most of what we consider to be “the atmosphere”, including the air we breathe and nearly all of the weather and clouds we see. In the troposphere, the temperature of the air decreases the higher you go. This layer exists between seven to 31 miles above the surface of Earth. Unlike the troposphere below, the air temperature actually increases with altitude making the air stratified. When possible, commercial jet aircraft fly in the lower stratosphere to avoid the turbulence which is common in the troposphere, due to convection. 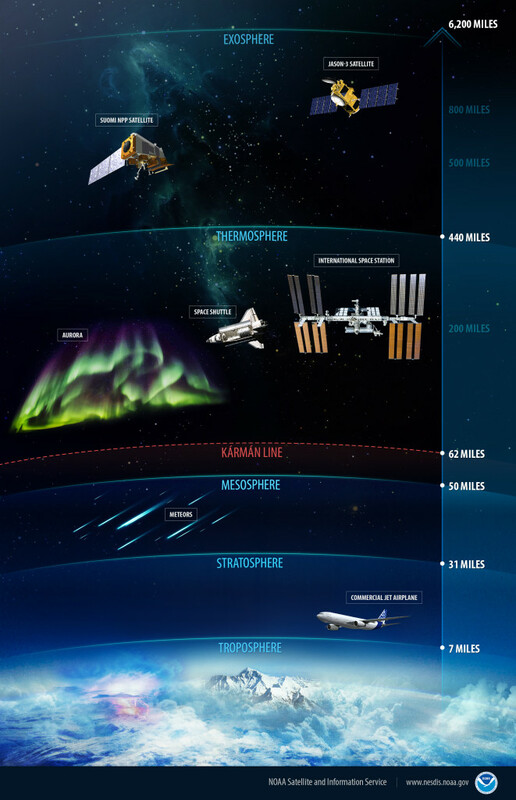 The third layer of Earth’s atmosphere, the mesosphere extends from around 31 to 50 miles high (the height at which you are considered an astronaut by U.S. standards). Considered one of the coldest places on Earth, the average temperature is around -120°F. This layer is where most meteors burn up upon entering Earth’s atmosphere and is the highest elevation at which a cloud can form. Home to the Kármán Line and spanning the area 50 to 440 miles above Earth’s surface, the thermosphere is the atmospheres second to last layer. The thermosphere is where high energy ultraviolet and x-ray radiation begin to be absorbed causing massive temperature variations. Highly dependent on solar activity, temperatures here can range from as low as -184°F to as high as 3,630°F. However, despite the high temperatures, this layer of the atmosphere would still feel very cold to our skin due to the very thin atmosphere. In the thermosphere, Earth’s curvature becomes distinctly clear and space travelers begin to experience “weightlessness”. Because of the heavily ionized atmosphere present in the thermosphere, it is also home to the phenomenon known as auroras. The final layer of Earth’s atmosphere, where it gradually gives way to outer space, is the exosphere. This layer extends from around 440 miles above Earth to nearly 6,200 miles. The atmosphere in the exosphere is incredibly thin and no longer behaves like normal gas. The atoms and molecules are so far apart that they can travel hundreds of miles without colliding with one and another. This layer contains a large portion of low-Earth orbiting satellites.